Sometimes the traditional types of emergency break glass are not suitable, perhaps because they are too strong, too weak or not versatile enough. In such cases, there are a variety of plastics which can be used depending on the desired properties. To find out which plastic might be suitable, please contact us with details of your project. Plastics are extremely versatile, durable and flexible, so there is likely to be a suitable one for your needs. The plastic is weakened by cutting weak spots into it making it break in a particular formation. 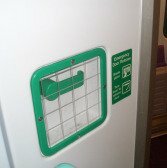 •	Safe - The weakened areas of the plastic assist the panel to break in a specified way, leaving minimal sharp edges. It is therefore much safer than glass. •	Flexible & Versatile - The diversity in plastics available means there will be one to suit your needs. Plastic parts can be made to most shapes, colours sizes and configurations. •	Strong - Strength is highly controlled via the weakened areas. •	If incorrectly specified, it can be unbreakable making it unsuitable in an emergency. Plastic which has been weakened is the answer to some emergency break glass problems. For more advice about which plastic may be suitable for you, please contact us with details of the project.